This is a list of musical compositions or pieces of music that have unusual time signatures. "Unusual" is here defined to be any time signature other than simple time signatures with top numerals of 2, 3, or 4 and bottom numerals of 2, 4, or 8, and compound time signatures with top numerals of 6, 9, or 12 and bottom numerals 4, 8, or 16. The conventions of musical notation typically allow for more than one written representation of a particular piece. The chosen time signature largely depends upon musical context, personal taste of the composer or transcriber, and the graphic layout on the written page. Frequently, published editions were written in a specific time signature to visually signify the tempo for slow movements in symphonies, sonatas, and concerti. 4 time, with each variation lasting ​2 3⁄4 bars, and therefore commencing each time one crotchet earlier in the bar than the preceding one had done. 2 bars between rehearsal numbers 5 and 8. La Langeur, from Le follie francaise ou les dominos from Pieces de Clavecin by Francois Couperin. 2 signature from rehearsal numbers 2–7, 25–35, 42–47, 59–66, and 70–74. 4 bars in the sixth, tenth, and eleventh movements. 8 bars in the third movement. Five Pieces for Piano, op. 23, by Arnold Schoenberg. 1 and between rehearsal numbers 28 and 29, and one bar before rehearsal number 36. Pli selon pli by Pierre Boulez. Movement III, "Improvisation II sur Mallarmé". Comme le vent, first of the Douze études dans toutes les tons mineurs, Op. 39, by Charles-Valentin Alkan. 16 is used in the concluding "Sacrificial Dance". Sketch, Op. 1 No. 10, by Alexei Stanchinsky. "O Fortuna" from Carl Orff's Carmina Burana (first four bars). Symphony No. 3 by Camille Saint-Saëns, in two sections (a total of 21 bars) at the end of the finale. Piano Sonata No. 1 in C major, Op. 1, by Johannes Brahms. Movement II, bars 47–49 and 51–53. 16 from bars 40 to 41, and again from bars 44 to 51. Symphonic Studies, Étude IX (first version) by Robert Schumann. Variations for piano, Op. 27, by Anton Webern, movement I.
Intrada, nebst burlesquer Suite, for two violins (the so-called "Gulliver Suite") by Georg Philipp Telemann. Movement II, "Lilliputsche Chaconne". 32 from bars 28 to 37. 16, except for one free-rhythm bar at the beginning and two at the end. Piano Sonata No. 1 in C major, Op. 1, by Johannes Brahms. Movement II, bars 46 and 50. Piano Sonata No. 3 in F minor, Op. 5, by Johannes Brahms. Movement II, bars 37–66 and 77–90. 16 from bars 52 to 53. Variations on a Theme by Robert Schumann, Op. 9, by Johannes Brahms. Variation XI. 4 before repeating the pattern. 4 (divided 3+2+3) at rehearsal N.
8 in the strings at rehearsal 75. Music for Strings, Percussion, and Celesta by Béla Bartók. 4 in the rest of the orchestra. 16 time, all divided 3+2+3. 16 time, at the fourth bar following rehearsal 35, in the movement "Ragtime". Time signatures that group nine beats into 3+3+3 are very common in music. This section only lists other groupings, such as 2+3+2+2. 4. "[T]he changes of meter either between or within every section establish themselves as a kind of leitmotif." (Alan Pollack's 'Notes On' series, no. 136). Threni, id est Lamentationes Jeremiae Prophetae, by Igor Stravinsky. "Solacium", part 3 of "De Elegia Tertia". 4, though it is not notated as such, either in the original manuscript or the new edition. "Where but for Caravan Would I Be" (1969), by Caravan. "The Eleven", by the Grateful Dead. Friends, by Led Zeppelin. Main theme. 8 in the bridge, phrasing interludes that Harrison drew from Indian music influences. 8. The song shifts between these metres for the remainder of the song. Mario Kart 64 (video game), music by Kenta Nagata, at the race results screen. "Man-Erg" (1971), by Van der Graaf Generator. 32 from bars 48 to 64. "Starless" (1974), by King Crimson. 8 at the 3-minute mark. "I Will Be Absorbed", by Egg. 8 after the drum solo (just over eight and a half minutes in). 16 time, divided 4+4+4+3 (in b. 501 some layers are in 3+3+3+3+3 and 3+4+4+3). 8 time signature written as well). "Birds of Fire" by Mahavishnu Orchestra. Guitar plays 5+5+5+3 while drums play 6+6+6. Violin from time to time plays 3+3+2+3+3+2+2. 8, as compound sextuple meter. 16 (grouped 5+5+5+3+3) and repeats this pattern during the intro and beginning of the song. 16 (The bottom stave is in ). Le marteau sans maître, by Pierre Boulez. Movement III "L'Artisanat furieux". 8 and includes numerous other times. 16 (Waugh 2003, 76), then says "we've listed all the popular time signatures" (Waugh 2003, 77). ^ Piano Sonata No. 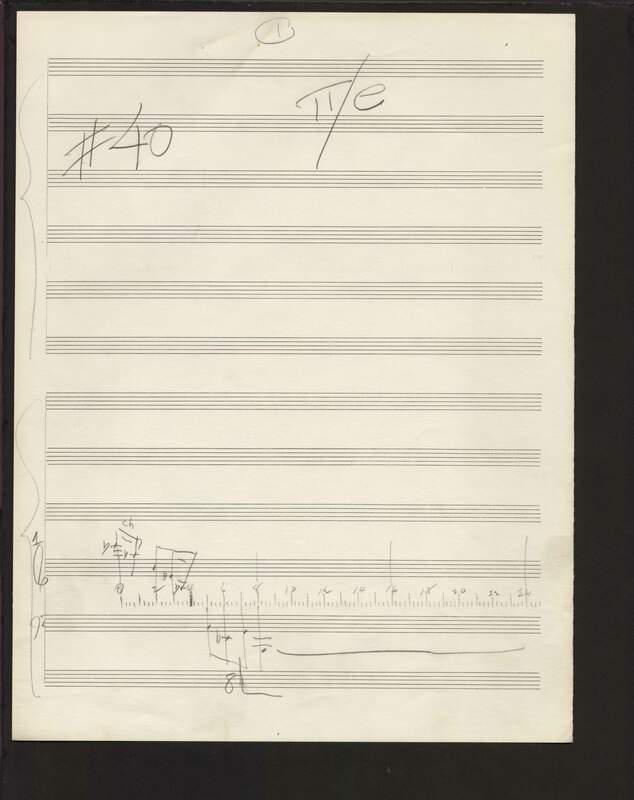 5 (Scriabin): Scores at the International Music Score Library Project (IMSLP). Leipzig: Edition Peters, 1971, plate E.P. 12588. ^ Edward Elgar, Symphony No. 1 (London: Eulenberg Edition, n.d.), 62–101. ^ Myaskovsky 1947, 4–8, 23–30, 41–44, 59–65, 70–73. ^ Revueltas 1971, 32, 34–38. ^ Allcock, Maartin, ed. (1998). Fairport Convention Songbook 2. Woodworm Music. pp. 56–59. ^ a b c Nilsson 1958, 3–15. ^ Dream Theater Keyboard Anthology. Transcribed by Chris Romero and Jordan Baker 2004, 30. ^ a b c "Lincolnshire Posy (Grainger, Percy) – IMSLP/Petrucci Music Library: Free Public Domain Sheet Music". ^ Dream Theater Black Clouds and Silver Linings Authentic Guitar TAB. 2009, 7. ^ "A Headache And A Sixty-Fourth". Retrieved 2010-08-21. ^ a b c Read 1964, 158. ^ Yokoyama, Shin-itchiro (21 February 2016). "Bach's Cello Suites, Editor's Notes: How do we play the Gigue of Partita No.6 ?". ^ Johann Bach (1985). Hans Bischoff, ed. Six Partitas and Overture in French Style. Alfred Music Publishing. p. 92. ISBN 978-0-7692-8604-4. ^ Alkan n.d. (ca.1861),[page needed]. ^ "Category:Stanchinsky, Aleksey". Retrieved 25 February 2015. ^ Score'sAnimation (7 October 2015). "1.- O Fortuna (Carmina Burana – C. Orff) Score Animation" – via YouTube. ^ See any of the scores available on https://imslp.org/wiki/R%C3%BCckert_Lieder_(Mahler%2C_Gustav). Bar 27 is at rehearsal number 4. 32 time. . . ."
^ Brahms 1928 Archived 2016-01-11 at the Wayback Machine, 78–79, 79–80. ^ Holst 1977, 4–6, 18–19, 23–24, 27–30. ^ Ligeti 1995, 9, b. 28. ^ a b Andriessen 1976, 1–4, 82–88, 90, 92, 95–97, 99, 119. ^ Stravinsky 1958, 11–12 and 19. ^ Bernstein 1950, 48, 52–54. ^ Bartók 1937, 1–5, 7–8, 10. ^ a b c musicaignotus (14 October 2009). "Antheil – Piano Sonata No. 2 'The Airplane'" – via YouTube. ^ a b c d e Timothy Smith (26 September 2015). "Kaikhosru Shapurji Sorabji – Sonata No. 1" – via YouTube. ^ Birtwistle 1996, 6–7 and 9. ^ Stravinsky 1962, 54, 56, 58, 60–61, 63, and 66. ^ a b Gable 2009, 91. ^ a b c d e "Extremes of Conventional Music Notation". ^ Tempo controlSlow down the song anytime you need it. "This Town Needs Guns - Crocodile Tab Online | UG Plus @ Ultimate-Guitar.com". Tp.ultimate-guitar.com. Archived from the original on 2013-09-29. Retrieved 2013-08-01. ^ "The Eleven and Other Rhythmic Oddities (Grateful Dead)". Retrieved 25 February 2015. ^ a b Dreiblats 2013. ^ a b Hail the Sun (19 February 2013). "Testotyrannosaurus.pdf" (PDF). Hail the Sun. Retrieved 11 May 2016. ^ "Uncommon Time". Retrieved 25 February 2015. ^ Liner notes to The Mason Williams Phonograph Record Warner Brothers LP, WS 1729. Burbank: Warner Brothers-Seven Arts Records, 1968. ^ Yanni (1993). The Best of Yanni; 11 selections from his top recordings. Hal Leonard Publishing. p. 16. 8 time (Stravinsky 1958, 52). ^ Le Jeune 1951–59, 2:85–88. ^ Jisi, Chris (2012). "Esperanza Spalding: E-Harmony". Retrieved April 29, 2015. ^ Hail the Sun (13 January 2013). "Eight Ball, Coroner's Pocket.pdf" (PDF). Hail the Sun. Retrieved 11 May 2016. ^ Howard Brubeck (ed. ), Dave Brubeck Deluxe Piano Album, (San Francisco: Derry Music Co., 1965), pp. 22–28. ^ J. A. Fuller Maitland and W. Barclay Squire (eds. ), The Fitzwilliam Virginal Book, vol. 2 (Leipzig: Breitkopf und Härtel, 1899; reprinted New York: Dover Publications, Inc., 1963), 34–39. ^ Randy Poe (20 September 2006). Skydog: The Duane Allman Story. Hal Leonard Corporation. p. 131. ISBN 978-0-87930-891-9. Retrieved 11 April 2012. ^ "The Daily Vault Music Reviews :". Retrieved 25 February 2015. ^ "The Annotated "The Eleven"". Retrieved 2017-03-08. ^ Primus (musical group), Primus Anthology: A thru N: For Guitar and Bass, transcribed by Jeff Jacobsen (New York: Cherry Lane Music, 2000), 17–20. ISBN 1575601540. ^ "Led Zeppelin – Friends (Tab)". tabs.ultimate-guitar.com. Retrieved 2019-02-19. ^ Pedler 2003, p. 555. 8, respectively. The special effect of running even eighth notes accented as if triplets against the grain of the underlying backbeat is carried to a point more reminiscent of Stravinsky than of the Beatles" (Alan Pollack's 'Notes On' series, no. 183). ^ "Rock Meets Classical, Part 4: Classical Concepts in King Crimson's 'Larks Tongues in Aspic'". www.brutalprog.com. Retrieved 2019-03-17. ^ Peart, Neil (2010-10-07). "Rush – Losing It Sheet Music (Digital Download)". Musicnotes.com. Retrieved 2017-03-08. ^ "" Neil Peart Biography, Drum Videos and Pictures | Famous Drummers". Drumlessons.com. Retrieved 2012-04-14. ^ "A prole do bebê No.2, W180 (Villa-Lobos, Heitor) – IMSLP/Petrucci Music Library: Free Public Domain Sheet Music". ^ a b Reynish, Tim. "Derek Bourgeois: An Assessment of his music in Two Parts". Retrieved 2017-03-08. ^ a b "Pops Concert Program Notes". Howard Performing Arts Center, Andrews University. March 8, 2008. Archived from the original on July 19, 2011. Retrieved November 8, 2009. ^ "Golden Brown by The Stranglers Songfacts". Songfacts.com. Retrieved 2012-04-14. ^ a b Andriessen 1976, 46, 69, and 101. ^ a b c d Macan 1997, 49. ^ "The Becoming". Retrieved 2017-03-08. ^ "Ken Westphal Illustration & Design". Retrieved 25 February 2015. ^ Davison and Apel 1974, 9; Pöhlmann and West 2001, 96–99. ^ Macan 1997, 49; Chatburn n.d.
^ Perkins 2000, 2:18–40 (score). ^ a b "danbruno.net: Battle music in Mother 3". ^ Oldfield, Mike (2007). Changeling – Autobiography of Mike Oldfield. Virgin Books. p. 111. ISBN 978-1-85227-381-1. ^ Llyod Webber, Andrew (1987). The Phantom of the Opera Libretto/ Vocal Score. The Really Useful Group Ltd.
^ a b c d Read 1964, 157. ^ Andriessen 1976, 65 and 74. ^ Geoffrey Himes (2008). "Lionel Loueke: African American". Retrieved 2017-03-08. ^ "Crystalline". bjork.fr. Retrieved 2012-04-14. ^ "Hollow". bjork.fr. Retrieved 2012-04-14. ^ "The National – I Should Live in Salt". Retrieved 2018-07-07. ^ "Moon". bjork.fr. Retrieved 2012-04-14. ^ a b John McLaughlin, John McLaughlin and the Mahavishnu Orchestra: John McLaughlin's Scores to 28 Classic Recordings (Van Nuys: Alfred Publishing, 2006):[page needed]. ISBN 0-7390-4255-6. ^ Alkan n.d. (ca.1862), 1:25. ^ Perkins 2000, 2:1–17 (score). ^ a b c Flans 1982. ^ "Rusty Cage". Underneath the Cover. 2012-04-25. Retrieved 2018-03-06. ^ a b Le Jeune 1951–59, 1:32–33. ^ DreiblatsJaanis (2013). "Gibbon Guitar Pro by This Town Needs Guns". 911Tabs.Com. Retrieved 2017-03-08. ^ Read 1964, 160; Stravinsky 1958, 29. ^ "All About Jazz". Archived from the original on 15 November 2002. Retrieved 25 February 2015. ^ "Baboon Guitar Pro by This Town Needs Guns @ Ultimate-Guitar.Com". Tabs.ultimate-guitar.com. Retrieved 2013-08-01. ^ "Ganondorf Battle (Legend of Zelda: Ocarina of Time) Bass/Guitar Tab". GameTab. August 8, 2009. Retrieved 2017-03-08. ^ "New Millenium Cyanide Christ". Retrieved 2017-06-28. ^ Telemann 1728, 37; Telemann 1970, 14–15; Zohn 2004, 247: "the ‘Brobdingnagische Gigue’—no doubt inspired by the English jig Gulliver plays with great effort on a sixty-foot spinet—is danced in giant steps, trudging along in twenty-four semibreves to the bar." ^ Fenlon 2002, 90 & 102–106. ^ "OFFICE OF STRATEGIC INFLUENCE (O.S.I.) BIOGRAPHY". Archived from the original on 19 August 2014. Retrieved 25 February 2015. ^ Tempo controlSlow down the song anytime you need it. "This Town Needs Guns - 26 Is Dancier Than 4 Tab Online | UG Plus @ Ultimate-Guitar.com". Tp.ultimate-guitar.com. Archived from the original on 2013-09-29. Retrieved 2013-08-01. ^ "Top 10 Weirdest Odd-Time Signature Songs". www.ultimate-guitar.com. Retrieved 2019-03-15. ^ "Matt Savage plays "Blues in 33/8" in New York". YouTube. 2007-01-01. Retrieved 2013-08-01. ^ Fenlon 2002, 41; Fienberg 2004, 228–29 & 231–32. ^ Davis, Chip (1987). Fresh Aire II. Omaha, Nebraska, United States: Dots and Lines Ink. p. 55. ^ a b c Read 1964, 170. ^ Nilsson 1958, 8; Read 1964, 172. ^ Nilsson 1958, 10; Read 1964, 172. ^ Nilsson 1958, 10 & 12; Read 1964, 172. ^ Nilsson 1958, 11; Read 1964, 172. ^ "Don't Blame Me, It Was Henry Cowell's Idea". 15 March 2008. ^ Chávez 1972, 16, 19. ^ Stockhausen 1967, 1, 6, and 7. ^ Stockhausen 1957, 52, 60–62, 66. Alkan, Charles Valentin. n.d. (ca. 1861). Douze études dans toutes les tons mineurs, Op.39: Scores at the International Music Score Library Project (IMSLP). Paris. Simon Richault. Plate 13171.R. Alkan, Charles Valentin. n.d. (ca. 1862). Esquisses, Op. 63: Scores at the International Music Score Library Project (IMSLP). Paris. Simon Richault. Plate 13476.R. Andriessen, Louis. 1976. De Staat. Hawkes Pocket Scores 1234. London, Paris, Bonn, Johannesburg, Sydney, Tokyo, Toronto, and New York: Boosey & Hawkes. Bach, Johann Sebastian. 1968. The Musical Offering [and] The "Goldberg Variations". Kalmus Study Scores no. 720. [N.p. ]: Edwin F. Kalmus, Publisher of Music. Reprinted Melville, NY: Belwin Mills Publishing Corp.
Banks, Anthony. n.d. "Firth of Fifth: Introduction". Scribd.com (accessed 22 March 2012). Banks, Evan. 2009. "Humming the Bassline: Just Like You Imagined". American Observer: American University's Graduate Journalism Magazine (September 29) (Archive from 3 August 2012, accessed 26 February 2015). Barber, Samuel. 1943. String Quartet, op. 11. G. Schirmer's Edition of Study Scores of Orchestral Works and Chamber Music 28. New York: G. Schirmer. Bartók, Béla. 1937. Musik für Saiteninstrumente, Schlagzeug und Celesta / Music for String Instruments, Percussion and Celesta / Musique pour instruments à cordes, percussion et célesta. Philharmonia Partituren PH 201. Vienna and London: Universal Edition. Bartók, Béla. 1940. Mikrokosmos: Progressive Piano Pieces = Pièces de piano progressives = Zongoramuzsika a kezdet legkezdetétöl, 6 vols. New York and London: Boosey & Hawkes. Bartók, Béla. 1993. Concerto for Orchestra, revised edition, edited by Peter Bartók. Full score. London and New York: Boosey & Hawkes. Bernstein, Leonard. 1993. The Age of Anxiety: Symphony No. 2, for piano and orchestra, after W. H. Auden, revised version, full score, corrected edition. [New York]: Jalni Publications, Inc., Boosey & Hawkes. Bernstein, Leonard. 1950. Fancy Free: Ballet, corrected edition 1988. N.p. : Jalni Publications, Inc./Boosey & Hawkes. Bernstein, Leonard. 1994. Candide: A Comic Operetta in Two Acts, Scottish Opera edition of the opera-house version (1989). Book by Hugh Wheeler, based on the satire by Voltaire; lyrics by Richard Wilbur, with additional lyrics by Stephen Sondheim, John Latouche, Dorothy Parker, Lillian Hellman, and Leonard Bernstein; edited by Charles Harmon. [New York]: Jalni Publications, Inc.; Boosey & Hawkes. Birtwistle, Harrison. 1996. The Cry of Anubis, for tuba and orchestra. Hawkes Pocket Scores 1292. London: Boosey & Hawkes Music Publishers Limited. Bois, Rob du. 1979. Concert voor twee violen en orkest. Amsterdam: Donemus. Borodin, Alexander Porfirevich. . Symphony No. 2, revised and edited by Alexander Glazunov and Nikolai Rimsky-Korsakov. St Petersburg: Bessel. Reprinted Leipzig: Ernst Eulenburg, [c.1920]; Reprinted Moscow: Muzgiz, 1931. .
Boulez, Pierre. 1957. Le marteau sans maître. Pour voix d'alto et 6 instruments. Poèmes de René Char. Philharmonia Partituren/Scores/Partitions no. 398. Vienna and London: Universal Edition. Brahms, Johannes. 1928. Sonaten für Klavier zu 2 Händen, edited by Emil von Sauer. Leipzig: C. F. Peters. Brahms, Johannes. 1972. Trios, für Klavier, Violine und Violoncello, nach Eigenschriften, Erstausgaben und Handexemplaren des Komponisten hrsg. von Ernst Herttrich; Fingersatz der Klavierstimme von Hans-Martin Theopold. Munich: G. Henle Verlag. Britten, Benjamin. 1941. Diversions for Piano (Left Hand) and Orchestra, Op. 21. London: Boosey & Hawkes. Britten, Benjamin. 1945b. Passacaglia, opus 33b, from the opera Peter Grimes. London: Boosey & Hawkes. Britten, Benjamin. 1946. Quartet No. 2 in C, op. 36. London: Boosey & Hawkes. Britten, Benjamin. 1956. Canticle III (Still Falls the Rain), op. 55, for tenor, horn, and piano. Words by Edith Sitwell. London, Paris, Bonn, Cape Town, Sydney, Toronto, Buenos Aires, New York: Boosey & Co., Ltd.
Chatburn, Sean. n.d. Karn Evil 9: 1st Impression, Part 1: Emerson, Lake & Palmer". Jelly Note blog site (accessed 4 October 2016). Chávez, Carlos. 1972. Tercera Sonata. Colección Arión, no. 119. México, D.F. : Ediciones Mexicanas de Música. Copland, Aaron. 1945. Appalachian Spring (Ballet for Martha). Hawkes Pocket Scores 8. London: Boosey & Hawkes. Davies, Peter Maxwell. 1985. Symphony No. 3. Hawkes Pocket Scores 1114. London, Paris, Bonn, Johannesburg, Sydney, Tokyo, Toronto, and New York: Boosey & Hawkes. Davison, Archibald T., and Willi Apel (eds.). 1974. Historical Anthology of Music, vol. 1: Oriental, Medieval and Renaissance Music. Revised edition. Cambridge: Harvard University Press. ISBN 0-674-39300-7. Doe, Paul (ed.). 1988. Elizabethan Consort Music: II. Musica Britannica 45. London: Stainer and Bell, published for the Musica Britannica Trust. Dreiblats, Jaanis. 2012. "'Panda' by This Town Needs Guns: Demo". 911Tabs.com (14 December) (accessed 19 August 2013). Dreiblats, Jaanis. 2013. "'Rabbit' by This Town Needs Guns: Demo". 911Tabs.com/UltimateGuitar.com (9 January) (accessed 17 August 2013). Enescu, George. 1965. Dixtuor pentru 2 flaute, oboi, corn englez, 2 clarinete, 2 fagoturi și 2 corni / Dixtuor pour 2 flûtes, hautbois, cor anglais, 2 clarinettes, 2 bassons et 2 cors, Op. 14. [Bucharest]: Editura Muzicală a Uniunii Compozitorilor din Republica Sociatlistă România. Fenlon, Sean. 2002. "The Exotic Rhythms of Don Ellis". DMA diss. Baltimore: Johns Hopkins University, Peabody Institute. ISBN 0-493-60448-0. Fienberg, Gary Andrew. 2004. "It Doesn't Have to Be Sanctified to Swing: A Musical Biography of Don Ellis". PhD diss. Pittsburgh: Carnegie Mellon University. ISBN 0-496-86817-9. Flans, Robyn. 1982. Untitled interview with Vinnie Colaiuta. Modern Drummer (November). Gable, Christopher. 2009. The Words and Music of Sting. The Praeger Singer-Songwriter Collection. Westport: Praeger Publishers. ISBN 0275993604. Genesis (musical group). 2001. Anthology. Milwaukee: Hal Leonard. ISBN 0-634-02063-3. Genesis (musical group). 2002. Genesis Guitar Anthology. Hal Leonard Guitar Recorded Version. [United States]: EMI Music Pub. ; Milwaukee: Hal Leonard Corporation. ISBN 0-634-02067-6. Gilmore, Bob. 1994. "Icebreaker". Liner notes to Icebreaker: Terminal Velocity. Argo 443 214–2. CD recording. London: The Decca Record Company Limited. Ginastera, Alberto. 1946. 12 American Preludes (Doce Preludios Americanos), 2 vols. New York: Carl Fischer. Ginastera, Alberto. 1955. Estancia: Ballet in One Act and Five Scenes. Reduction for piano. Buenos Aires: Barry Editorial, Com., Ind., S. R. L.; [n.p. ]: Boosey & Hawkes. Ginastera, Alberto. 1969. Don Rodrigo: Opera in Three Acts and Nine Scenes, Op. 31. Vocal Score. London: Boosey& Hawkes Music Publishers Limited. Ginastera, Alberto. 1974. Harp Concerto, opus 25. Hawkes Pocket Scores 1185. London: Boosey & Hawkes. Grady, Kraig. n.d. "Gending Boehme" liner notes. In An Overview (and History) of Anaphorian Music (accessed 18 April 2015). Gutmann, Peter. 2003. "Peter Ilyich Tchaikovsky: Symphony #6 ("Pathetique")" Classical Notes (accessed 2008-03-23). Haigh, Chris. n.d. "Fiddling Around the World: Rock Violin". Fiddlingaround.co.uk (accessed 19 August 2013). Hansell, Sven, and Carlida Steffan. 2001. "Adolfati, Andrea". The New Grove Dictionary of Music and Musicians, second edition, edited by Stanley Sadie and John Tyrrell. London: Macmillan Publishers. Helmore, Rev. Thomas. 1879. "Accent". A Dictionary of Music and Musicians (A.D. 1450–1889) by Eminent Writers, English and Foreign, 2 vols, edited by George Grove, 1:12–18. London: Macmillan. Hiley, David. 2001. "Quintuple Metre". The New Grove Dictionary of Music and Musicians, ed. S. Sadie and J. Tyrrell, vol. 20:682–83. London: Macmillan. Hocker, Jürgen. n.d. "Conlon Nancarrow: List of Works (English Version)". In Der Komponist Conlon Nancarrow: Leben und Werk eines mexikanischen Einsiedlers, With many English Contributions (accessed 15 July 2013). Holst, Gustav. 1973. Double Concerto, op. 49, for two violins and orchestra. Revised edition by Imogen Holst. London: Curwen Edition, Faber Music Ltd.; New York: G. Schirmer Inc. First published in 1930 by J Curwen & Sons Ltd.
Holst, Gustav. 1977. A Choral Fantasia, op. 51, edited by Imogen Holst. London, Zürich, Mainz, and New York: Ernst Eulenburg Ltd.
Holst, Gustav. 1979. The Planets: Suite for Large Orchestra, op. 32. New edition prepared by Imogen Holst and Colin Matthews. Hawkes Pocket Scores 22. London: Boosey & Hawkes. Howard, Patricia. 1969. The Operas of Benjamin Britten: An Introduction. New York and Washington: Frederick A. Praeger, Publishers. Ives, Charles. 1920. Second Pianoforte Sonata "Concord, Mass., 1840–60". [Redding, Conn.]: C. E. Ives. Third and fourth movements from this edition at IMSLP. Le Jeune, Claude. 1951–59. Airs (1608), edited by D. P. Walker, with an introduction by François Lesure and D. P. Walker, 4 vols. in 3. Publications of the American Institute of Musicology: Miscellanea 1. Rome: American Institute of Musicology. Leonard. 2011. "Gojira: The Art of Dying Drum Tab". Songsterr website (22 February) (accessed 14 April 2012). Ligeti, György. 1973. Sechs Bagatellen für Bläserquintett (Five parts: flute, oboe, clarinet in B-flat, horn in F, bassoon). Mainz and New York: Schott. Lloyd Webber, Andrew (music), and Tim Rice (lyrics). 1979. Evita, vocal score, selections. Melville, N.Y.: Leeds Music Corp—sole selling agent, MCA Music. Macan, Edward. 1997. Rocking the Classics: English Progressive Rock and the Counterculture. New York: Oxford University Press. ISBN 978-0-19-509888-4. Macdonald, Hugh. 2001. "Alkan [Morhange], (Charles-)Valentin". The New Grove Dictionary of Music and Musicians, ed. S. Sadie and J. Tyrrell. London: Macmillan. Medtner, Nikolai 1998. The Complete Piano Sonatas Series I. New York: Dover Publications. ISBN 0-486-29978-3. Myaskovsky, Nikolai. 1947. Symphony No. 17, Op. 41 (score). Moscow: Muzgiz. Nancarrow, Conlon. n.d. [Study] No. 40 (autograph punching score). In Der Komponist Conlon Nancarrow: Leben und Werk eines mexikanischen Einsiedlers, With many English Contributions, edited by Jürgen Hocker (Accessed 15 July 2013). Nilsson, Bo. 1958. Mädchentotenlieder, Faksimilepartitur. Vienna, Zürich, and London: Universal Edition. Page, Nick. 1989. Niska Banja: Serbian Gypsy Dance, arranged for SATB choir. Doreen Rao's Building Bridges. Common Roots Choral Music. London: Boosey & Hawkes. Perkins, Wayne L. 2000. "Don Ellis' Use of 'New Rhythms' in His Compositions : The Great Divide (1969), Final Analysis (1969) and Strawberry Soup (1971)" (vol. 1); "Original Compositions: She's Only 19 (1999), Malibu Shuffle (1999) and Cruisin' P.C.H. (1999)" (vol. 2). Ph.D. diss. Los Angeles: University of California Los Angeles. Pollack, Alan W. 1999. "Notes on 'Here Comes The Sun'". Notes on ... Series, no. 183. The 'Official' rec.music.beatles Home Page <http://www.recmusicbeatles.com> (accessed 3 February 2016). Pope, Isabel, and Tess Knighton. 2001. "Fernández, Diego". The New Grove Dictionary of Music and Musicians, ed. S. Sadie and J. Tyrrell. London: Macmillan. Portnoy, Mike, Robert Wallis, and Paul Siegel. 1999. Mike Portnoy: Liquid Drum Theater. 2 vols. Reissued on DVD, Color, Dolby, DVD, NTSC. 2-DVD set. Hudson Music HD-Z-LV01. [N.p. ]: Hudson Music, 2001. ISBN 0-634-03829-X. Prokofiev, Sergei. 1926. Сказка, Шутка, Марш, Призрак [Skazka, Shutka, Marsh, Prizrak]. (Conte, Badinage, Marche, Fantôme), op. 3, для фортепяно. Moscow: Gos. izd-vo, Muzykal’nyi sektor. Prokofiev, Sergei. 1955. Sobranie sochinenii [Собрание сочинений, "Collected Works"], 20 vols. Moscow: Gos. Muzykalnoe Izd-vo. Ravel, Maurice. 1934. Don Quichotte a Dulcinée. Paris: Editions Durand. Ravel, Maurice. 1975. Frontispice: [pour S. P. 503 (poème du Vardar) de R. Canudo]: deux pianos [cinq mains]. Paris and New York: Éditions Salabert. Read, Gardner. 1964. Music Notation: A Manual of Modern Practice. Boston: Alleyn and Bacon, Inc.
Revueltas, Silvestre. 1949. Sensemayá. G. Schirmer's Edition of Study Scores of Orchestral Works and Chamber Music 51. New York: G. Schirmer, Inc.
Revueltas, Silvestre. 1958. Homenaje a Federico García Lorca (Homage to Federico García Lorca (score). New York: Southern Music Publishing Company, Inc.
Revueltas, Silvestre. 1971. Alcancías for Small Orchestra (score). New York: Southern Music Publishing Company, Inc.; Hamburg: Peer Musikverlag G.M.B.H. Richards, Paul. 1987. "Africa in the Music of Samuel Coleridge-Taylor". Africa: Journal of the International African Institute 57, no. 4 ("Sierra Leone, 1787–1987"): 566–71. Shostakovich, Dmitri. 1983. Sobranie sochinenii tom 13 [Собрание сочинений том 13, Collected works volume 13], Izdatelstvo "Muzyka" Moskva. Stevenson, Seth. 2014. "What Is the Time Signature of the Ominous Electronic Score of The Terminator? A Slate Investigation". Slate.com (26 February) (accessed 27 February 2014). Strait, Thomas John. 2000. "The Rhythmic Innovations of Don Ellis: An Examination of Their Origins as Found in His Early Works". DMA diss. Greeley: University of Northern Colorado. ISBN 978-0-599-79347-7. Stravinsky, Igor. n.d. Petroushka: A Burlesque in Four Scenes. Kalmus Miniature Orchestra Scores, no. 79. New York: Edwin F. Kalmus Publisher of Music. Stravinsky, Igor. 1924. Histoire du soldat / Geschichte vom Soldaten / The Soldier's Tale. German version by Hans Reinhart. English version by Rosa Newmarch. London: J & W Chester/Edition Wilhelm Hansen Ltd.
Stravinsky, Igor. 1958. Threni, id est Lamentationes Jeremiae Prophetæ. Hawkes Pocket Scores 709. London: Boosey & Hawkes. Stravinsky, Igor. 1962. The Flood. London, Paris, Bonn, Johannesburg, Sydney, Toronto, New York: Boosey & Hawkes Music Publishers Limited. Stravinsky, Igor. 1965. Abraham and Isaac: A Sacred Ballad for Baritone and Chamber Orchestra. London, Paris, Bonn, Johannesburg, Sydney, Toronto, New York: Boosey & Hawkes Music Publishers Limited. Stravinsky, Igor. 1967. Requiem Canticles. London, Paris, Bonn, Johannesburg, Sydney, Toronto, New York: Boosey & Hawkes Music Publishers Limited. Stravinsky, Igor. 1970. The Rite of Spring (Le Sacre du Printemps). New York: International Music Company. Telemann, Georg Philipp (ed.). 1728. Der getreue Music-Meister. Hamburg: [Telemann]. Facsimile reprint, Basel: Musica Musica, [n.d.]. Telemann, Georg Philipp. 1970. Drei Duette für zwei Melodie-Instrumente. Hortus Musicus 11, edited by Dietz Degen. Kassel: Bärenreiter. Tschaikowsky, Peter Ilich. [n.d.]. Symphony No. 6 (Pathétique) in B Minor, Op. 74. New York: M. Baron Co.
Tye, Christopher. 1967. The Instrumental Music, edited by Robert W. Weidner. Recent Researches in the Music of the Renaissance 3. New Haven: A-R Editions. Villa-Lobos, Heitor. . A Próle do Bébé (No. 1), 8 vols. Rio de Janeiro: Casa Arthur Napoleão. Villa-Lobos, Heitor. 1927. A Próle do Bébé. No. 2: Os Bichinhos, 9 vols. Paris: Editions Max Eschig. Villa-Lobos, Heitor. 1969. Bachianas brasileiras no. 9, pour orchestre à cordes. Paris: Editions Max Eschig. Wagner, Jeff. 2010. Mean Deviation. Brooklyn: Bazillion Points. ISBN 978-0-9796163-3-4. Waugh, Ian. 2003. "Ten Minute Master No. 6: Time Signatures". Music Tech Magazine (May): 76–77. Wiehmayer, Theodor. 1917. Musikalische Rhythmik und Metrik. Magdeburg: Heinrichshofen's Verlag. Zohn, Steven. 2004. "The Sonate auf Concertenart and Conceptions of Genre in the Late Baroque". Eighteenth-Century Music 1, no. 2:205–47. This page was last edited on 17 April 2019, at 20:47 (UTC).